Kochi: Seafood exports may fall 20-30% by volume this fiscal to March 2009 as the global economic slowdown depresses demand, said a top official. Demand for seafood abroad typically spikes in November and early December. This year, however, exporters are seeing orders slackening, said Anwarh Hashim, national president of the Seafood Exporters Association of India. The situation is so bad that some buyers are demanding lower prices even when shipments have been made, and others are trying to renegotiate contracts, Hashim added. After the dollar rose against the euro and other currencies, the demand for lower prices has increased from European buyers, who account for almost 35% of Indian seafood exports. US demand for shrimp, among the most expensive exports, which accounts for at least 50% of Indian seafood exports, has slackened; lower-priced fish are taking its place. Hashim feared this tendency could cross the Atlantic as well as to East Asian countries. India’s marine exports totalled Rs7,500 crore in the fiscal year to March. To add to woes, freight rates have gone up in rupee terms by almost 20% since these are finalized in dollar terms. With a falling rupee, it has not only created hardship for many exporters, but also discouraged many others from importing foods that are processed or value-added here and then re-exported, such as cuttlefish and squid. Production costs are also rising, thanks to the climbing dollar and rising prices of chemicals and packing material. 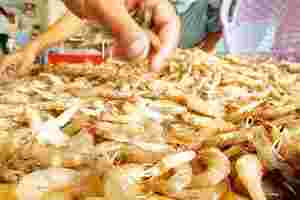 The cost of feed for shrimp farmers has also gone up since some feed manufacturers have stopped importing inputs due to the increasing dollar. Most of these imports are from countries such as Thailand and Japan. At the same time, overseas buyers are seeking to extend credit over the usual 120 days at a time when India’s banks are reluctant to increase post-shipment credit. To make matters worse, some banks are taking longer to negotiate documents backed by letters of credit from the US and Europe, Hashim claimed. It now can take up to a week before banks release funds, compared with same-day service earlier, he added. Hashim said that while exports till a month ago have not been affected, the months ahead when most orders are booked and shipments made, will likely look bleak. He called for the government to intervene and provide assistance to ensure that the earnings of not just the exporters but also the large number of fishermen are cushioned.